About 6 years ago, X and I visited a small town called Jiu Fen (九份) in Taiwan. We climbed up the many steps up the town to a popular dessert shop and ordered a bowl of dessert to share. 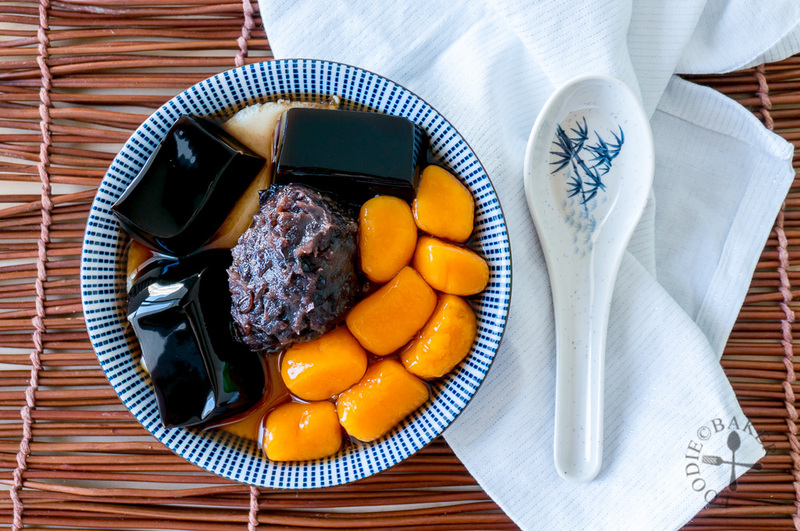 The dessert contained cooked beans, taro (yam) balls and sweet potato balls in a sweet syrup and lots of crushed ice. Having done a 4-hour hike in the intense summer heat earlier that day, this refreshing bowl of goodness was the perfect way to end the day – and that was also when I fell in love with those chewy balls. In Singapore, we are extremely fortunate because there are shops that sell this type of dessert. 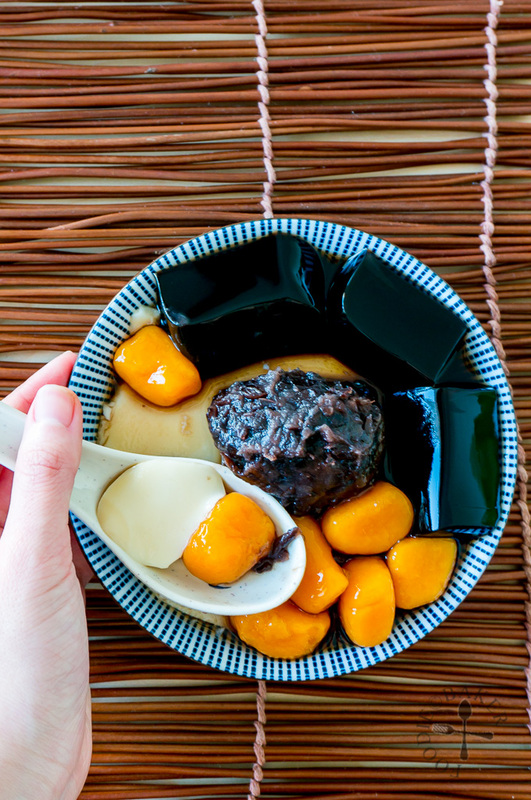 Nowadays, this dessert contains a mixture of Asian treats, such as tau huay (soy pudding), grass jelly etc. There is a particular shop that is pretty popular but it’s so freaking expensive and the amount of taro and sweet potato balls they give are so pathetically little. Since I’m currently living overseas, there was no way I can get my hands on this dessert (I can’t even find yam in the local market :roll:) so I decided to make my own! I went Google for help and most recipes I found require the use of sweet potato flour – an ingredient that I don’t have on hand. I finally stumbled upon a recipe that uses glutinous rice flour (found here) and tapioca flour (I brought it back from Singapore) so I decided to try that recipe. The sweet potato balls are not very difficult to make and they had a nice chewiness and bounciness which I really like (I ate like 8 or 10 at one go haha). However, there was a problem – I cannot remember what the original sweet potato balls taste like! 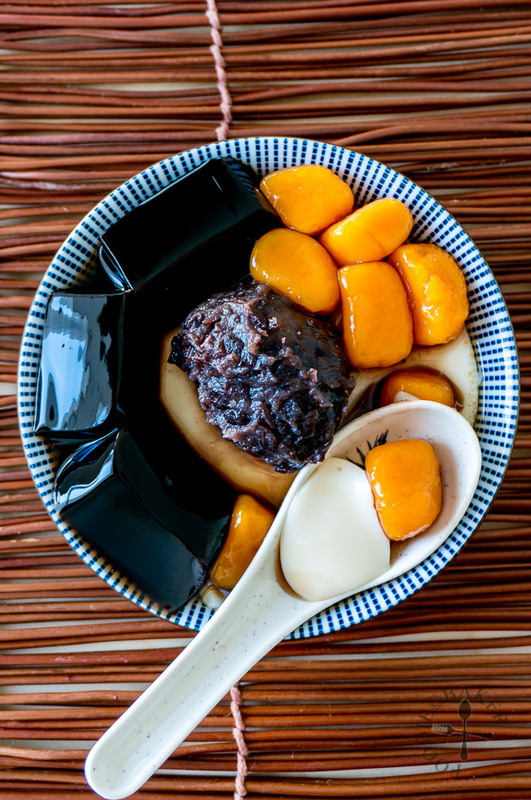 So I am not sure if they taste as authentic as those I had in Taiwan… if any of you dear readers managed to make them, do let me know what you think! I served the sweet potato balls with a few other Asian sweets: soy pudding I made with homemade soy milk and gelatin (I used the soy milk to gelatin ratio from Serious Eats); grass jelly (made from an instant grass jelly packet I brought from Singapore); and homemade Japanese-style red bean paste (also known as anko, a recipe I will share in the future). While my memory cannot tell if the sweet potato balls are authentic, the combination of everything above still made a super delicious dessert! 1) Peel the sweet potato and cut them into chunks. Steam the sweet potato for 15 to 20 minutes until they are soft. 2) Transfer the sweet potatoes into a sieve to drain away excess moisture. Then use a scraper and mash the sweet potato through the sieve. 3) Measure out 300 grams of sweet potato puree into a large mixing bowl and mix in the glutinous rice flour and tapioca flour. 4) You want to get a dough that is soft and does not stick to the spatula or hands. 5) Take a small portion of dough. 6) Roll it out into a log about 2-cm in diameter. 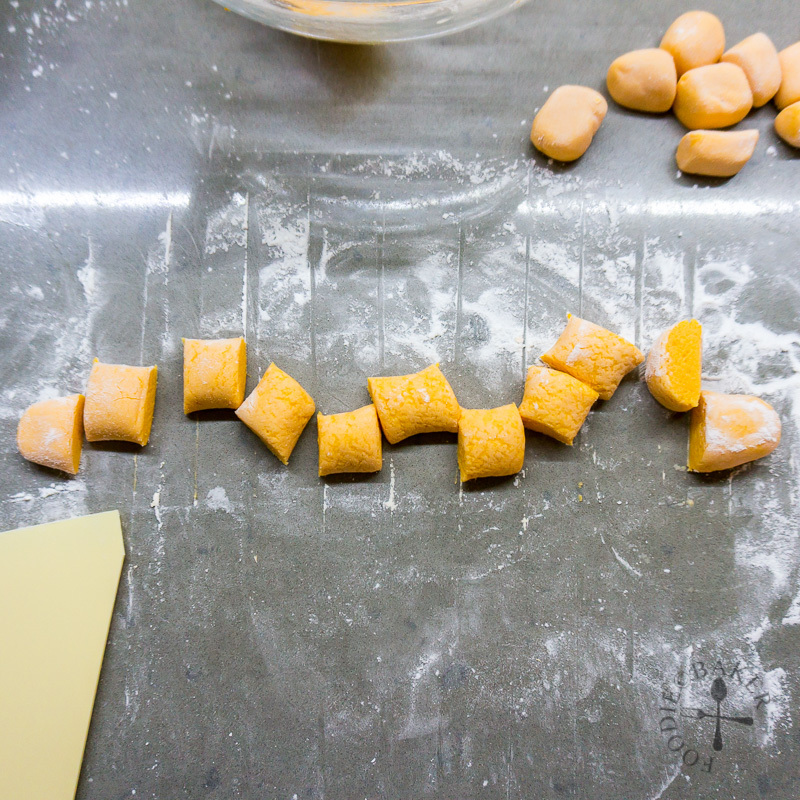 7) Cut them into 2-cm pieces. 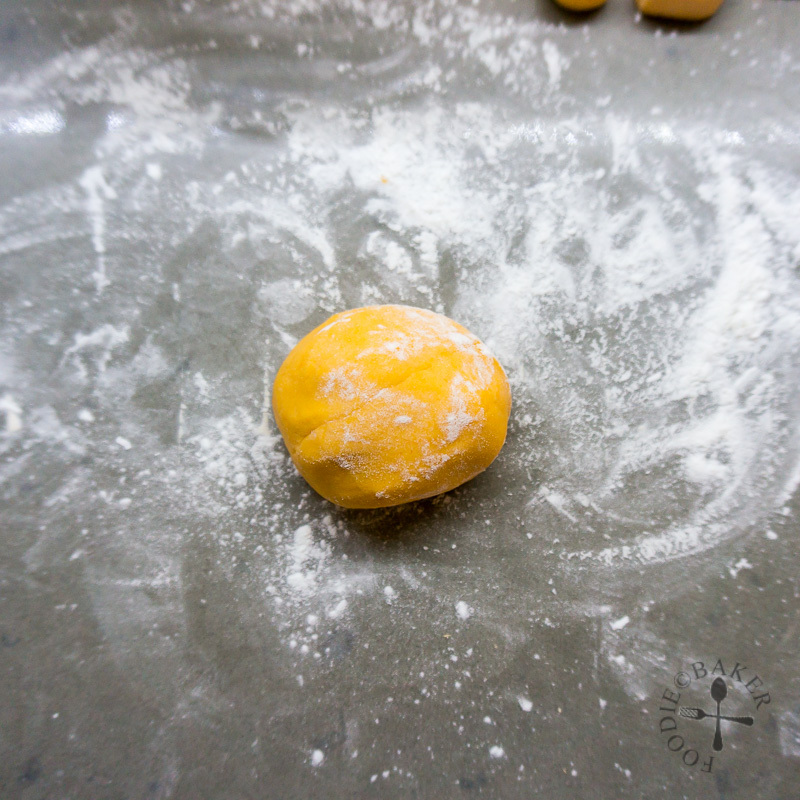 8) Dust the cut pieces generously with tapioca flour so they don't stick to one another while you make the remaining balls. The sweet potato balls can be a little irregular in shapes and sizes. 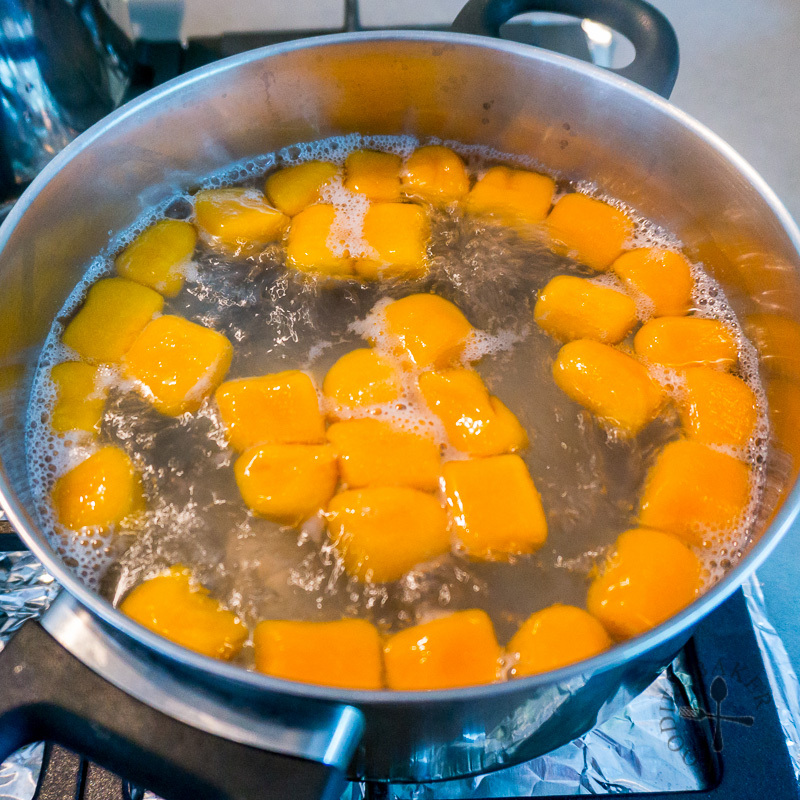 9) Boil the sweet potato balls in water until they float to the top. Boil them for an additional 2 minutes. 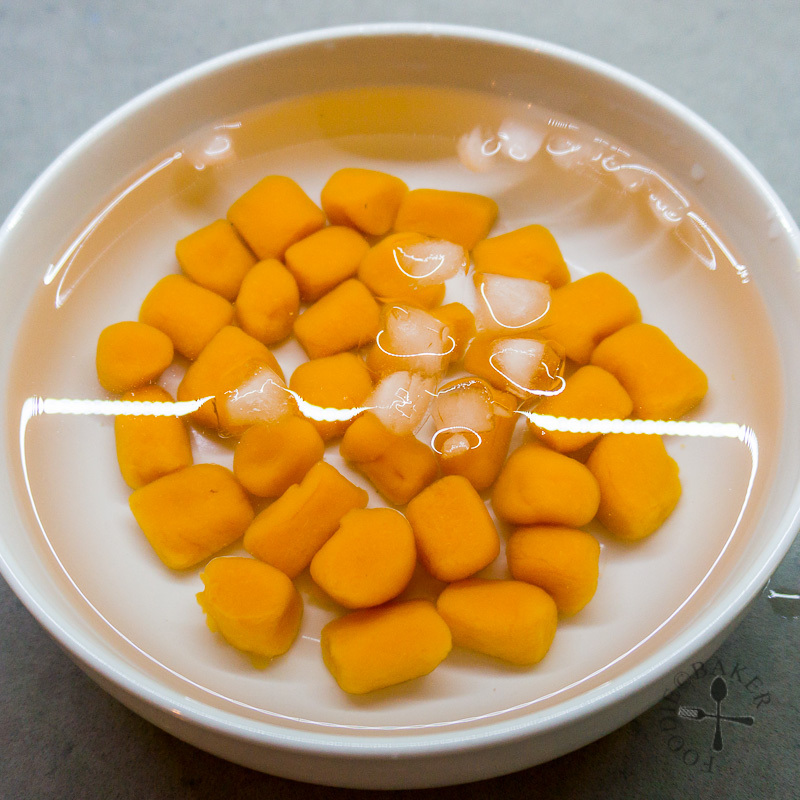 10) Strain and transfer the sweet potato balls immediately into a bowl of ice water. Let it cool down for 10 minutes, then transfer them into the Ginger Syrup to steep for at least 30 minutes before serving. One of my favourite Asian desserts! Don’t be put off by the length of the recipe because I included as much details as I could – hopefully this will make life easier for you who want to give these sweet potato balls a try! Also, it has been a long time since I last ate the dessert so it may not be as authentic. If you managed to give this a try, let me know how you find them in the comments! Bring the water and ginger (if using) to boil in a small pot. Add in the sugar, stir until sugar has dissolved and remove from heat. Let cool completely. The syrup can me made a day in advance and stored in the refrigerator. Peel the sweet potato and cut them into chunks. Steam the sweet potato for 15 to 20 minutes until they are soft. Transfer the sweet potatoes into a sieve to drain away excess moisture. 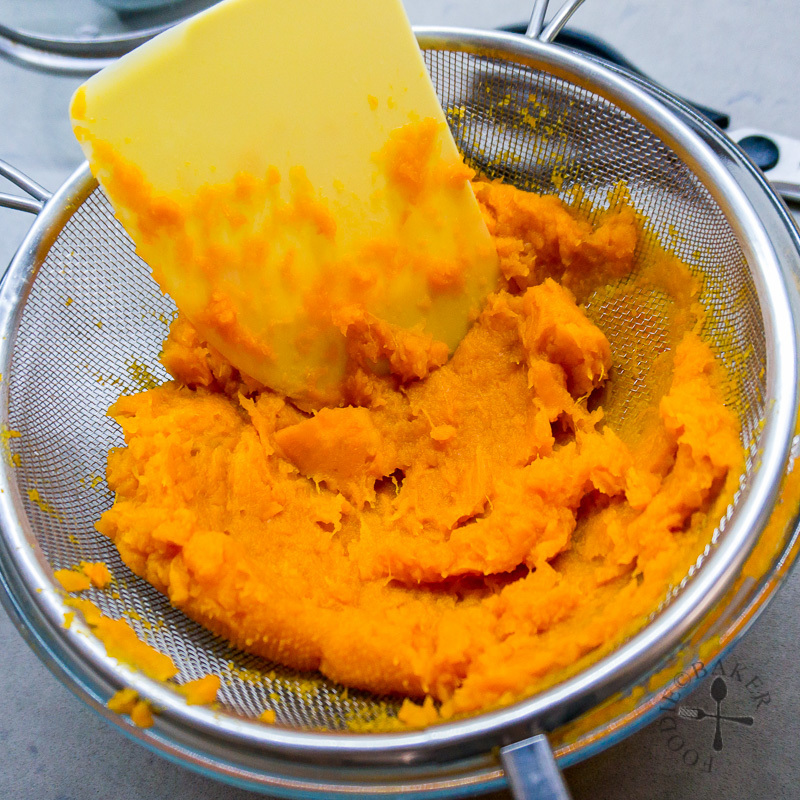 Use a scraper and mash the sweet potato through the sieve. This process is a little tedious but it helps to get a fine and smooth puree without lumps. 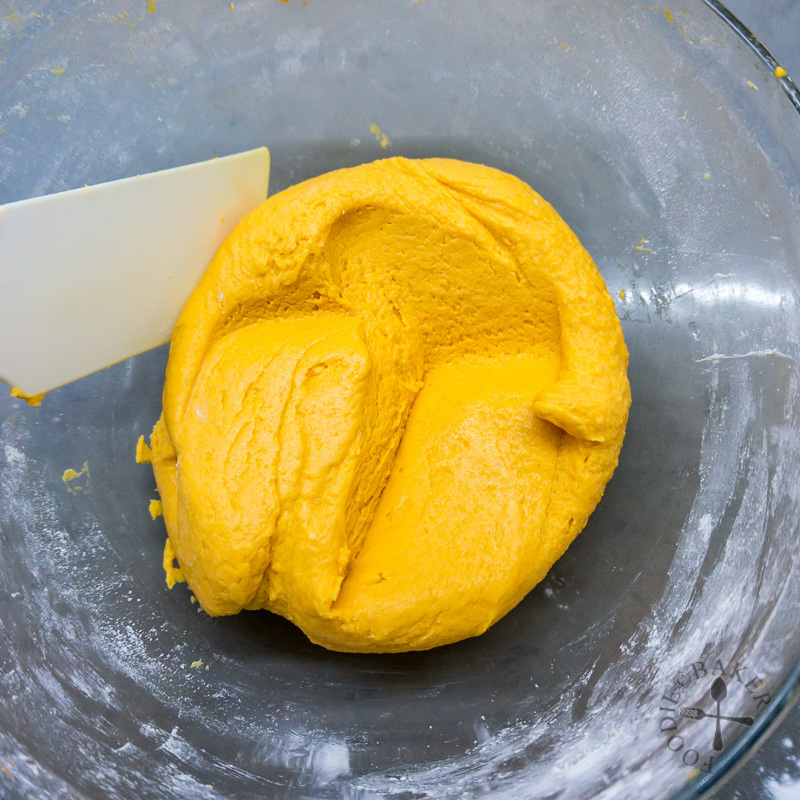 Once all the sweet potato is mashed, measure out 300 grams of sweet potato puree into a large mixing bowl. The remaining sweet potato puree can be used as a sandwich filling, pancake topping or eaten just like that! Whisk the tapioca flour and glutinous rice flour together in a small bowl. 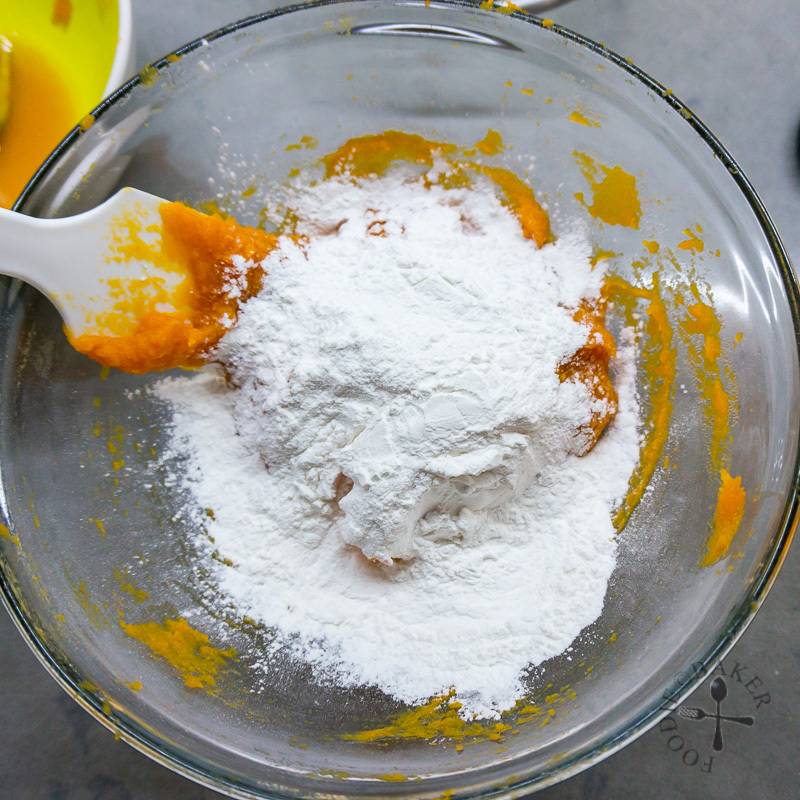 Add 80% (just roughly estimate) of the flour mixture into the sweet potato puree and mix very well with a spatula, adding more flour mixture if needed to get a soft dough that does not stick to the spatula or your hands. Test if the dough is ready by taking a small piece and roll it out into a log between your hands, if it doesn't stick, it's ready. If you need more flour, mix in additional tapioca flour and glutinous rice flour in the ratio 1:1 (e.g. 10 grams tapioca flour + 10 grams glutinous rice flour). Don't add to much flour otherwise the dough will crack when you roll it out. Once the dough is ready, dust the table top with tapioca flour. 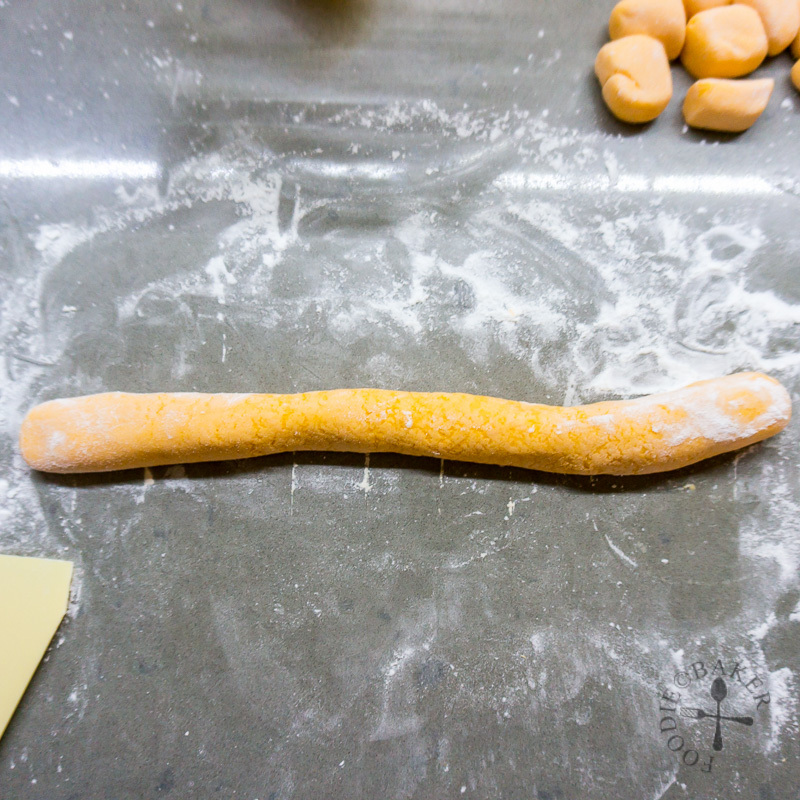 Take a small portion of dough and roll it out into a log about 2-cm in diameter. 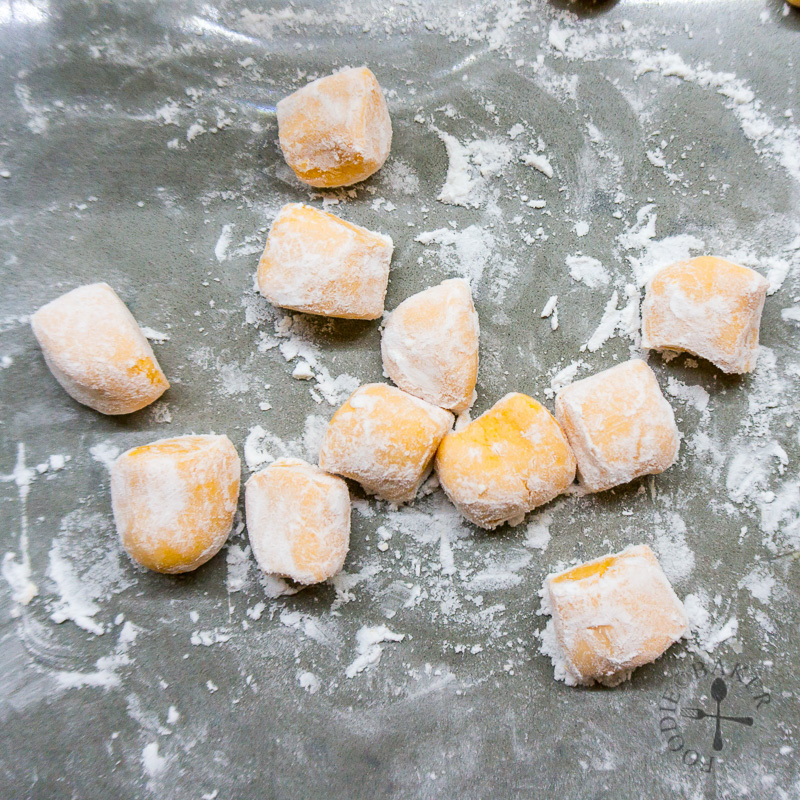 Cut them into 2-cm pieces, dust the cut pieces generously with tapioca flour (so they won't stick to one another) and set them aside. Repeat until all the dough is used up. The beauty of sweet potato balls is that you don't have to shape the balls, they can be left a little irregular in shapes and sizes. Freeze whatever you are not planning on eating on the day in an airtight container lined with parchment paper and dusted with tapioca flour. Cook the frozen sweet potato balls the same way as below. Bring a large pot of water to boil over high heat - don't use a small pot as it will longer for the water to come back to a boil. While waiting for the water to boil, get ready a large bowl of ice cold water. Add in the sweet potato balls and stir immediately to make sure they don't stick to each other and to the bottom of the pot. Cook over high heat, stirring frequently, until the balls float to the top. Let it boil for another 2 minutes. The balls will take about 5 minutes in total to cook (about 7 if they are frozen). Strain the balls and immediately transfer them into the ice water - add more ice if needed to keep the water cold. Let the balls sit in the water for 10 minutes. Strain the balls and add into the cooled/cold Ginger Syrup and steep for at least 30 minutes before serving. The sweet potato balls are best consumed on the day they are cooked, but can be stored in the refrigerator (in the syrup) for up to 2 days (the texture will be a little different though). 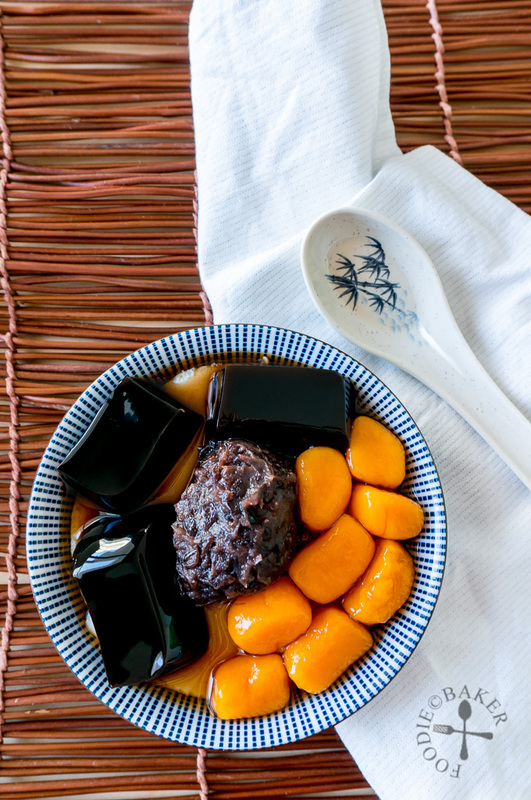 The sweet potato balls are best with green bean soup, soy pudding, grass jelly etc. - The sweet potato balls will have a glutinous rice flour aftertaste immediately after they are cooked, but once steeped in the syrup, the floury taste will be gone. 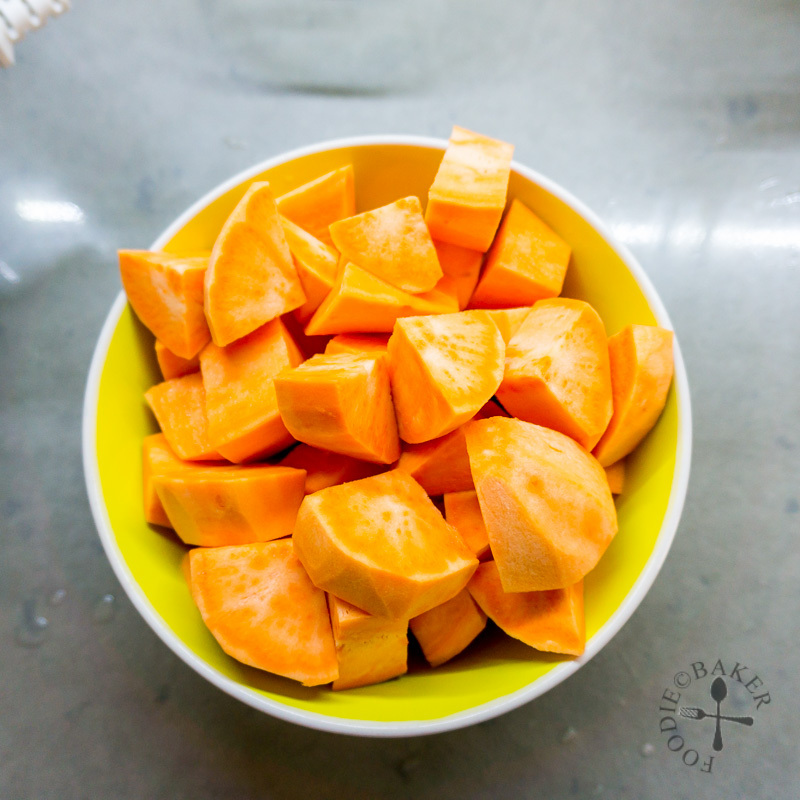 - The sweet potatoes can be swapped with taro (yam). Hi Angie, apologies for the late reply as I’m on a hiatus. I won’t suggest that because the cooked balls may harden in the refrigerator. You can freeze the un-boiled balls ahead as indicated in the recipe. I am totally mesmerized because not only do I love Asian dessert bowls (and have it all too rarely) but I have never seen/had these sweet potato balls! Given how much I love, love sweet potatoes, I’m dying to try it. You did an amazing dessert bowl here. I love every aspect of it…many of my favorites and I’m really coveting those sweet potato balls! Hi Moncia! Thank you, that dessert bowl has everything I love 😉 Let me know how your attempt with the sweet potato balls go! They remind me of sweet potato gnocchi which I have made but with regular AP flour. These must taste wonderful with the ginger!